Follow us as together we share gifts and the spirit of Christmas with neighbors, friends, sick children and the homeless, in honor of the birth that brought Christmas to be. You are invited to join us on the blog to share your own Christmas Giving stories here on the blog. Make a new tradition this year, and help your family see that it is much more fun to give than it is to receive! 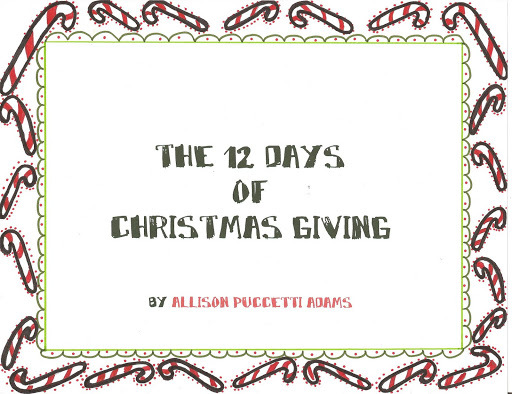 This is a delightful book to share with family and friends and to use as a model to create your own family traditions of giving. You may order this book in hardback or paperback. A percentage of all book sales goes to give back to the community. Link to order your signed copy in time for Christmas coming soon. Watch for book signings in your area or contact us for the date of your Dec. holiday opening. Allison Puccetti Adams has published two children’s books (Southern XYZ’s- Alabama Edition and A Gathering of Angels) (The Oaks Publishing Company) and written the history behind a hardbound collection of artwork by local artists in Birmingham Sketchbook (Indigo Publishing). Her new release, also a picture book for children of all ages, The Twelve Days of Christmas Giving, shares the spirit of Christmas with children of all ages in honor of the birth that brought Christmas to be. She has written for newspaper and most recently conducted interviews for Southern Beauty Magazine, digging to the heart and soul of people like Patti Hall (The Little Zoo that Could-Animal Planet), Heather Johnson (JH Ranch), Emily Proctor (CSI Miami), Christina Hendrix (Mad Men), LeAnn Rimes and Debbie Reynolds. Her love for writing is contagious and she is knee deep in a Southern fiction novel to be released in 2010. Allison and her husband, Chad, live in Birmingham with four children ages 16-4, two dogs, and a cat. They are active in their little church of 12,000 (growing) (www.churchofthehighlands.com) and encourage you to find the Christ, not only in Christmas but in every day life. They love to teach their children to be active in giving. Their giving continues as they sponsor students in their home each year as well, receiving many more blessings there than they give. Allison is also an artist and teaches art in her community.